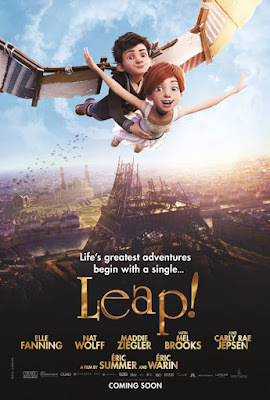 There is nothing particularly memorable about Leap! an animated film being released by The Weinstein Co. that was originally titled Ballerina when it premiered in France and the United Kingdom last winter. That said, there is nothing particularly offensive about it either. Rather, Leap! is a sincere attempt to re-visit and reiterate age old lessons to the younger generations that continue to be born and require reassurance that they too can accomplish their dreams with hard work and dedication. That is essentially what Leap! comes to be as it sells the underdog story of a young girl who overcomes obstacles such as being an orphan in order to accomplish her dreams of becoming a ballet dancer. The film earns some credibility and points for uniqueness by taking the chance of placing itself in a period setting for no other reason than writer/directors Éric Summer and Éric Warinwhich wanted to which would seem to inherently be a reason for youngsters to disengage, but alas the movie chugs along not missing a beat despite the fact parents who have seen any movie ever will be able to guess the beats Leap! will seemingly follow. This never becomes an issue though, as the film sets its audience up to accept this then revels in the setting allowing it to influence the different approaches the movie is able to illustrate in regards to our two protagonists key passions. Félicie (Elle Fanning) with her dancing and Victor (Dane DeHaan) who is an inventor with an affinity for devices that might help us to one day fly. All of this endears us to the two of them immediately as not only are they orphaned and living in the midst of the late-1880's, but despite as much they have hopes and dreams and are bound to find a way out of their situation no matter how difficult Luteau (Mel Brooks), the groundskeeper at the orphanage, fights to keep them in line. The groundwork is laid early for what the viewer can expect as far as narrative goes as well as for how Summer and Warinwhich will handle the craft of this type of storytelling that relies on such unsurprising, but well-intentioned clichés. What Leap! has in its back pocket is that none of these obvious or typically telling factors corrupt the ever-glowing optimism that it holds and delivers through to its predictable, but appropriately cheery conclusion. And so, it is the late 19th century and 11-year-old Félicie is not one to necessarily settle into her role as a poor orphan girl who only dreams of becoming a ballerina. Though she lacks the formal training of other girls her age she is determined and therefore partners with Victor to run away together so that they both might have a shot at fulfilling their aspirations. Venturing to beautiful Paris the ambitious Félicie and smitten Victor quickly become separated with Victor seemingly meeting his goals in an efficient manner by getting a gig as an office boy in Gustave Eiffel's workshop. Félicie, however, isn't as immediately lucky as it would seem Victor is as, on her first night, she stumbles into the celebrated school of the Paris Opera Ballet where she is seen and ultimately rescued from the clutches of a presumptuous security guard by a mysterious cleaner with a limp who Félicie comes to know as Odette (Carly Rae Jepsen). Odette just so happens to also be the maid for Régine Le Haut (Julie Khaner), a wealthy restaurant owner in town whose daughter, Camillle (Maddie Ziegler), has been conditioned to be the next great ballet dancer at the Paris Opera; all Camille awaits now is her letter of acceptance into the prestigious school. After some convincing Odette agrees to allow Félicie to stay with her until she gets on her feet. While helping Odette clean, Félicie will occasionally watch Camille practice until one day when Camille notices as much and can't help but to hurl insults Félicie's way for little more than not being born into the kind of wealth Camille seems to take for granted. And so, when Félicie ends up intercepting Camille's letter from the Opera she takes it and assumes Camille's identity in order to fulfill her own dream. Unaware of how she landed in such a position, Odette agrees to teach Félicie all she knows about ballet which would seem to be more than she initially let on after the school's exacting choreographer, Mérante (Terrence Scammell), hints at as much while conducting a competition for Félicie's class that will have one of the girls from her class being chosen to dance Clara in The Nutcracker. Victor (Dane DeHaan) and Félicie (Elle Fanning) plot their escape from the orphanage that holds them hostage. What more is there to then say about Leap! if expectations have been adjusted and a short synopsis has been conveyed? Not much, really. More, the best and most interesting things to discuss further about this animated film deal in how smooth and distinct the animation looks despite coming from a host of production companies. While the delayed release and low-key critical response would do nothing but indicate a worst case scenario in terms of quality what Leap! actually delivers is a rather gorgeously rendered film made picturesque by its sun-bathed locations and focus on the art of dance and thus the types of beauty that can be elicited from such an art form. While it may not start out that way, Leap! comes to be a movie that fully embraces the difficulty and stamina that it takes to pull off something that, on its exterior, seems so pure. And while the movie may not unravel the layers of ballet like an onion it does give us this endearing character who has a passion for something and therefore sees it through to her either accomplishing that dream or at least giving it the best possible shot she can. As stated before, the characters are immediately likable, but more than this Leap! takes a balanced approach in not wearing out its welcome as the movie with a young female protagonist that doesn't care to be a princess or one that is defiantly feminine, but rather a young lady who is simply determined and ambitious with a good head on her shoulders as made tough by the system she's been brought up in while all the while keeping intact her innocence and immaturity. Félicie doesn't always make the best or right decision, but the point is of course for her to learn from these mistakes and ultimately shape the best version of who she is as a person in helping her come to realize the goal she sets for herself at the beginning of the film. Félicie is an engaging character and while the beats her journey follows are familiar there is enough care and affection developed for her character over the course of eighty-nine minutes that this makes up for a lot of the picture's other generic qualities. None of this is to say that Leap! is one of the best animated movies of the year, Cars 3 is much more interesting and The LEGO Batman Movie is the best of the year by a long shot, but would I rather show my almost three year-old daughter this instead of Despicable Me 3 or The Emoji Movie? Absolutely.